Looks to hit the market in 2015. Want to achieve superhuman strength without going near a gym or protein shake? 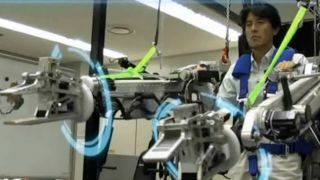 Activelink, a Panasonic subsidiary, is working on a powered exosuit just for you. It can lift 220 pounds and move at speeds up to 5mph. It's even named the Power Loader after the Caterpillar P-5000 Work Loader from Aliens. Activelink says it wants to get its exosuit on the market in 2015. We can't wait to use it for, err, really serious work.